Clan Maclean Atlantic Association has available a limited number of Clan Maclean flags. These flags are based on the battleaxe symbol, and designed for the association by Holly Lennox, a talented graphic designer. Clan Maclean Atlantic would like to thank Holly for her hard (and often frustrating) work! The crest usually seen on clan gear for the Macleans is the Tower, which is the crest of our Chief, and when enclosed in a belt and buckle, indicates a loyal clansman or woman. This crest was lawfully registered by the Duart family in 1908, but not until after there was much discussion and debate as to whether it should be the tower or the battleaxe. The older Clan Maclean crest, (and the one in more common non-commercial use) is the battleaxe crest. Elizabeth Roads, the Lord Lyon Clerk of Scotland, and keeper of the records at the court of the Lord Lyon (who determines who can have coats of arms, badges, etc. for Scotland) said in an article on Maclean heraldry: "Although it does not appear in the crest of the Chief, the most common crest for the Macleans is the battleaxe between the cypress and laurel, and this clearly commemorates descent from Gillean of the BattleAxe". Canon Allan Maclean of Dochgarroch, the Chairman of the Clan Maclean Heritage Trust, a Chieftain of the Clan, Past President of Clan Maclean Association and a person consulted in the process of developing the flag, says the battleaxe is the proper crest for all Macleans. 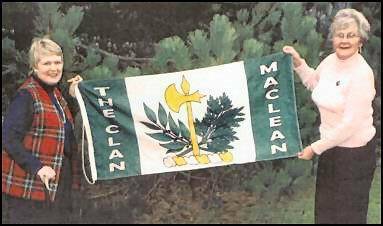 The Maclean flags at the last Clan Maclean International gathering all had a battleaxe on them. Sir Lachlan Maclean, our chief, proudly displays both crests: his very distinctive capbadge has both the tower and the battleaxe on it. The flags measure 27"x54" and are made of 200 denier heavyweight nylon.